From failure to massive cultural icon – the Boeing 747 | Shortfinals - aviation and more! In the 1960s, the U.S.A.F. was looking to acquire a new, big transport. The Lockheed C-141 Starlifter was about to be introduced (1965), but the demands of the Vietnam War made it imperative that the service acquire something capable of handling much bigger loads. As was normal at the time, several major American manufacturers considered submitting proposals, and the Boeing Airplane Company was among them. Boeing’s fierce rivals – Lockheed – were eventually awarded a contract in October, 1965, and went on to build the impressive C-5A Galaxy transport which is still in service to this day. Boeing had invested a lot of time and energy towards studying the USAF proposal, and this effort was not lost. Like Lockheed, Boeing had schemed an upper deck with 30 seats for crew and other passengers. What that did was instantly make what was becoming known as the Boeing 747 easily convertible to a freighter with a massive freight door in the nose. Alternatively, when the 747 was used as a passenger airliner, the camel-like ‘hump’, could be used as a bar, or an enlarged section for first-class passengers. On the 13th April, 1966, Pan-Am placed an order for 25 of the 747-100 launch version, for the then staggering sum of $525 million. Powered by four Pratt & Whitney JT9D turbofans – other customers would later specify the General Electric CF6 or the Rolls-Royce RB.211 – the Boeing 747 offered a 20′ wide cabin (at maximum), now less than 185′ long, and twin-aisle comfort with trans-oceanic range. The aircraft was built in what was, at the time, the largest building on Earth, at Boeing’s Everett facility, near Seattle. All these superlatives related to size gave rise to the aircraft’s nickname, ‘the jumbo jet’. Yet, there was quite a gamble going on. As well as the financial risk to the company, their engineers had made a conscious decision to alter the stiffness and mass of the wing in such a way as to allow for the necessary aeroelastic effects in flight (all lifting surfaces are twisted/subjected to a torsional load, to a greater or lesser extent as the aerodynamic force increases) whilst obtaining the maximum aerodynamic performance from the wing. Their calculated gamble paid off. The new, giant airliner had taken only 4 years to design, develop and certify; an incredible time frame for such a large aircraft. Not only that, but it was the first airliner equipped with the ultra-accurate Inertial Navigation System, from scratch. The first commercial service was a Pan-Am flight from John F Kennedy Airport, New York to London’s Heathrow Airport, on the 22nd January, 1970. A new era was born. The wingspan of the new airliner was close to the maximum that a modern airport could cope with, without major redesign of taxiways, terminal stands and other facilities. There were problems, of course; there always are, with ANY new airliner. One difficulty was the fact that the Pratt & Whitney JT9D-3A engines – the world’s first high bypass ratio turbofan engine – needed an 8 foot diameter nacelle, to accommodate the massive fan blades. At high power settings (say, on take-off), this could actually cause the engine’s nose cowl to distort to an oval shape! What happened next was not good – the tips of the fan blades began to rub against the inside of the cowl, thereby risking damage and ultimate failure. The interim solution was to crop the blades, so that they could never touch the distorted cowl. However, that meant a significant drop in efficiency, and a loss of thrust on climb-out. The ultimate fix came when Boeing’s designers fitted a stiff, ‘Y’- shaped beam internally to brace the engine nacelle, and prevent distortion! An airliner is continually being modified, as designers, engineers and sales staff react to changing airline priorities. No sooner had the 747-100 flown, than it was followed by the improved -200 (first flight, 11th Oct, 1970). The -200B, with an EUD (Extended Upper Deck) came next, with the ‘hump’ being stretched by 23 feet, making it possible to seat 69 passengers ‘upstairs’, plus another 410 in a mixed-class configuration. Swissair was the launch customer for this version, which was equipped with the 54,750 lb static thrust JT9D-7R4G2 engines. The next important variant was the -300, which was updated, but the empty weight had grown and it, therefore, had less range than the -200. What was thought to be the last major ‘stretch’ of the 747 came with the version you can see above, the Boeing 747-400. In 1987, Boeing launched the -400 and announced that it had unprecedented initial order book of 116 firm orders. The -400 had the -300 fuselage, which meant more passengers than the -200, and a redesigned, modern, 211 foot long wing, with swept-back ‘winglets’ at the tips, to give greater efficiency (through less drag), and uprated engines; its first flight was on 29th April, 1989. Such was the appeal of this ‘jumbo’ that by 1991, the order book stood at 423! The 747-400 you can see above, moving across the apron in the evening light, is at John F. Kennedy Airport, New York. 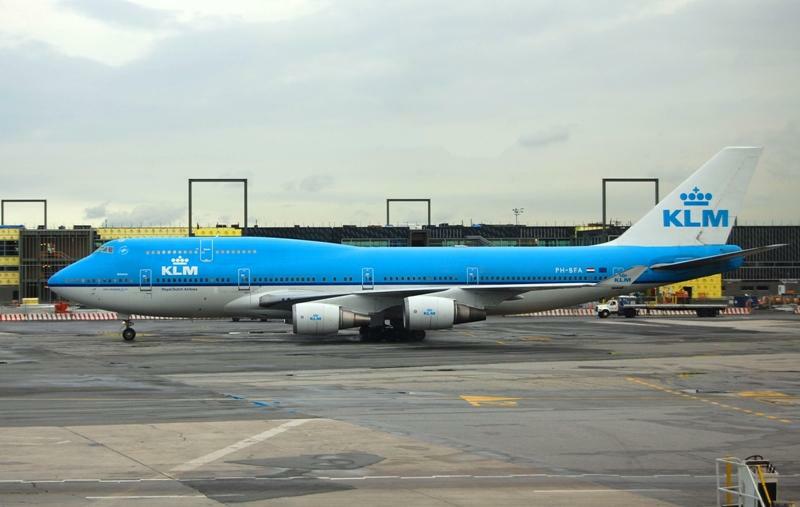 It is PH-BAS, ‘City of Atlanta’, and is the very first 747-400 delivered to KLM – Royal Dutch Airlines. As such it has been seen in many cities across the world, from Tokyo to Sydney, from London to New York. KLM (Koninklijke Luchtvaart Maatschappi) is said to be the oldest airline still operating under its original name, having operated its first flight on the 17th May, 1920. It is now part of the ‘Sky Team Alliance’, a grouping of more than 20 of the world’s airlines, including Air France, KLM, Saudi Arabia Airlines, Delta Airlines, Korean Air and many more passenger and cargo carriers. Unfortunately KLM was involved in the world’s worst air disaster, when KLM Flt 4805, a 747-206B, PH-BUF and a Pan Am Flt 1736, a B747-121, N736PA collided in thick fog on the runway at Los Rodeos Airport, Tenerife, Canary Islands. There were 580 dead although, amazingly, 70 people survived this horrific crash. The 747 production line, by any normal reckoning, should have been shut down by now, but a series of mis-steps by the company over the years, first with the supersonic Boeing 2707 project and then the ‘Sonic Cruiser’ (which wasn’t intended to be supersonic, just rather fast), and the rise of the rival Airbus A380, (which is capable of carrying a maximum of 853 passengers), meant that the 747 had to be revitalized one more time, with an even longer fuselage, and redesigned wings offering higher efficiency. Hence, the new 747-8 a stretched and modernized ‘jumbo’ of which 106 have been ordered. Its future, however, seems to lie in the field of cargo work, rather than the carriage of passengers, with Cargolux Airlines, Cathay Pacific Cargo, and Silk Airways of Azerbaijan all ordering the 747-8F version. Call it what you will – Boeing 747, ‘jumbo jet’, ‘Queen of the Skies’ – this is one flying machine which has gone from an idea for a military freighter to a true icon of the modern age. Wonderful assessment Ross. I think that Juan Trippe fit into the equation for the B-747 a bit as well. This was the first airliner I flew on — a trip to Hawaii — and I was amazed to see over a dozen of these crawling about Honolulu International (it made quiet an impression on a novice traveller).